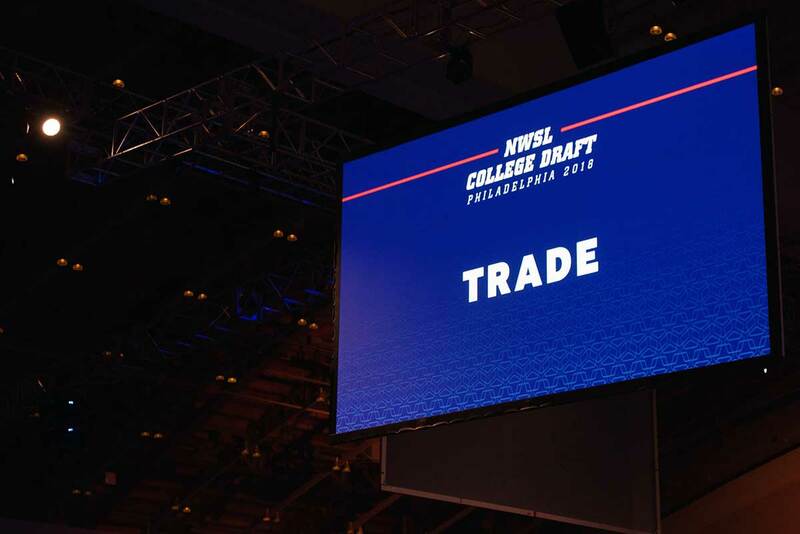 Entrance to the 2018 NWSL College Draft. Sky Blue FC head coach Denise Reddy speaking with media at the 2018 NWSL College Draft. 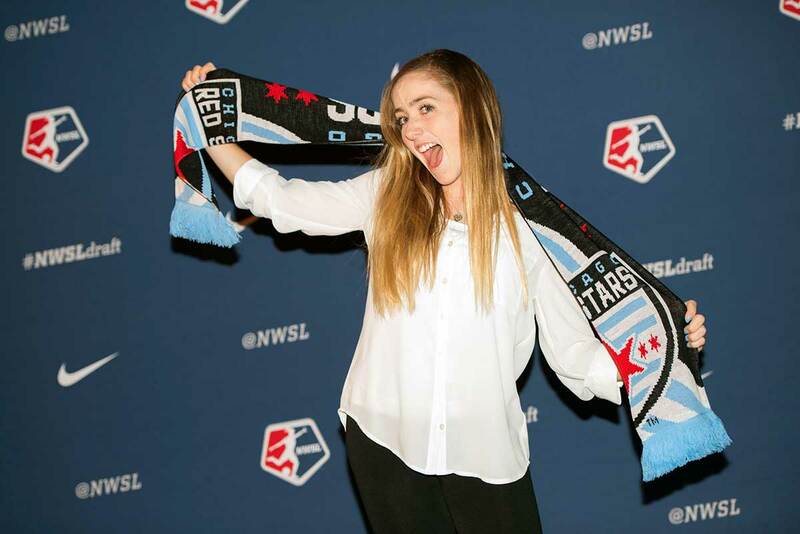 Cloud 9, Sky Blue support group, at the 2018 NWSL Collge Draft. 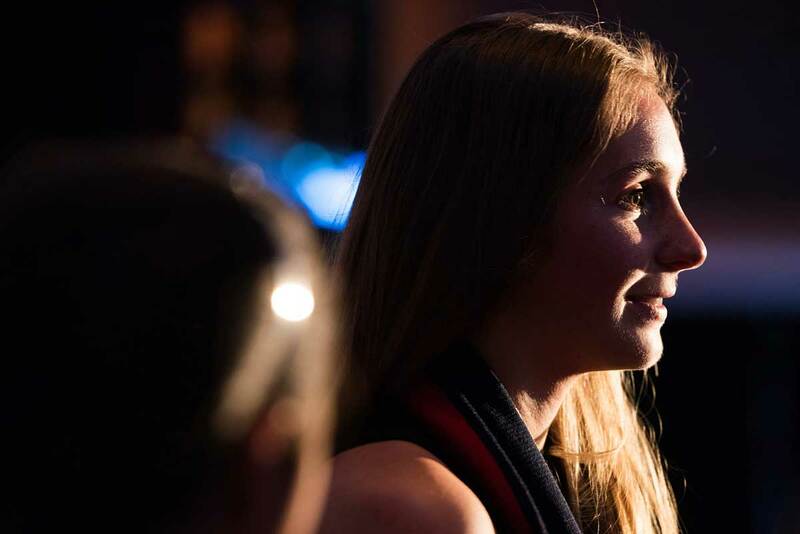 Nadine Angerer at the 2018 NWSL Collge Draft. 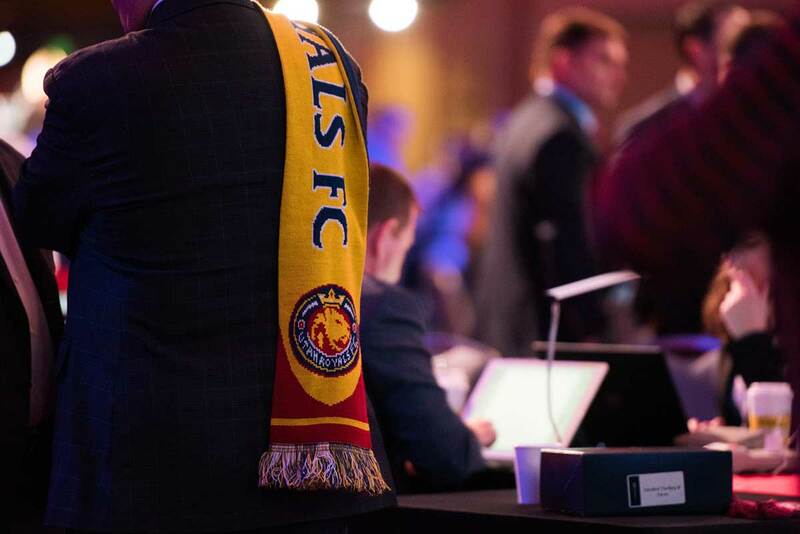 Scenes from the 2018 NWSL Collge Draft. 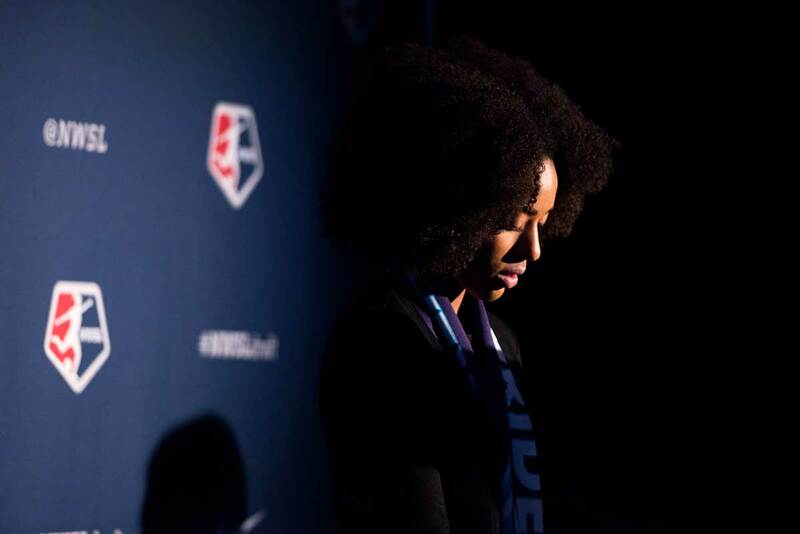 Nadia Gomes, draftee of Orlando Pride, at the 2018 NWSL College Draft. Morgan Reid, North Carolina's pick at No. 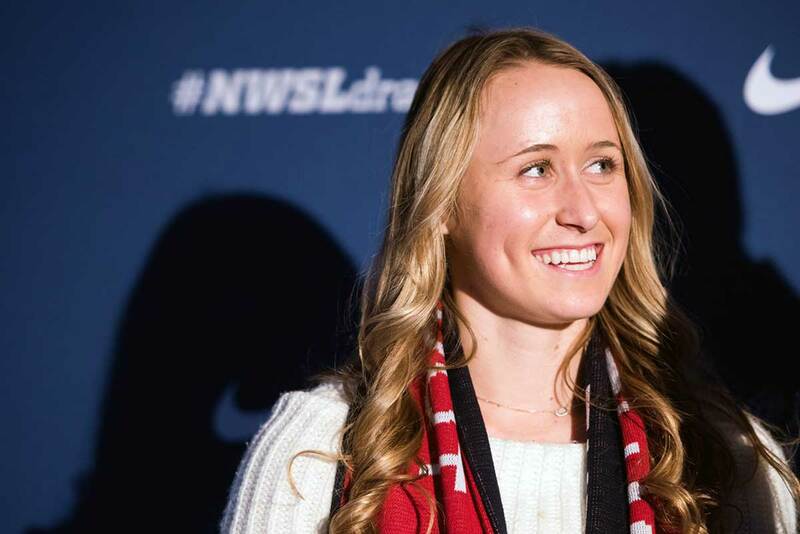 38, at the 2018 NWSL Collge Draft. Mark Parsons, head coach of the Portland Thorns. Mallory Eubanks addressing the media at the 2018 NWSL Collge Draft. 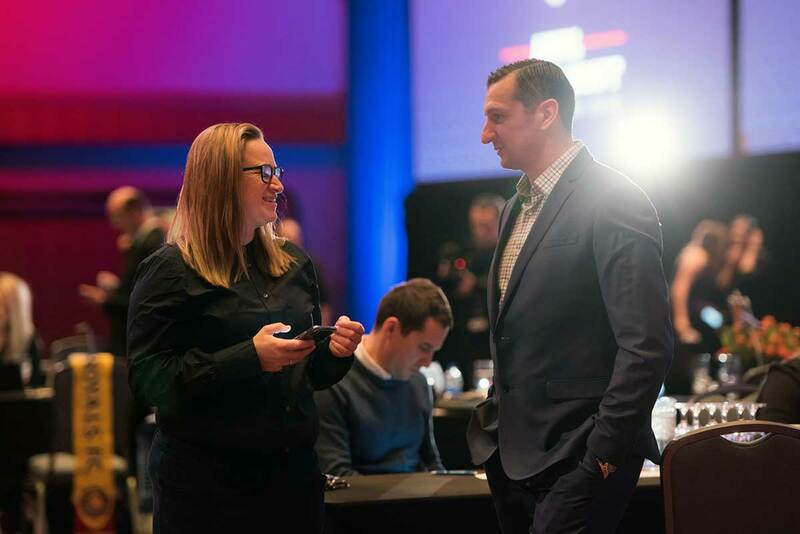 Laura Harvey and Vlatko Andonovski at the 2018 NWSL College Draft. Oh, what we would give to know what this is all about. Harvs and MarPar. Joanna Boyles, No. 32 pick by Boston. Indigo Gibson after being drafted by Chicago. 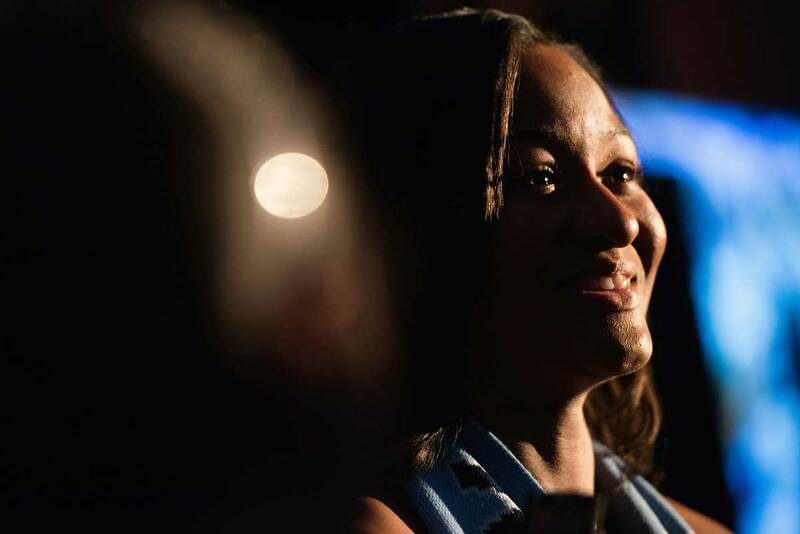 Imani Dorsey, minutes after being drafted by Sky Blue. Emily Boyd, drafted at No. 15 by Chicago. EJ Proctor with Utah Royals head coach Laura Harvey and staff. There's always one. Brianna Visalli, No. 19 pick by Chicago. 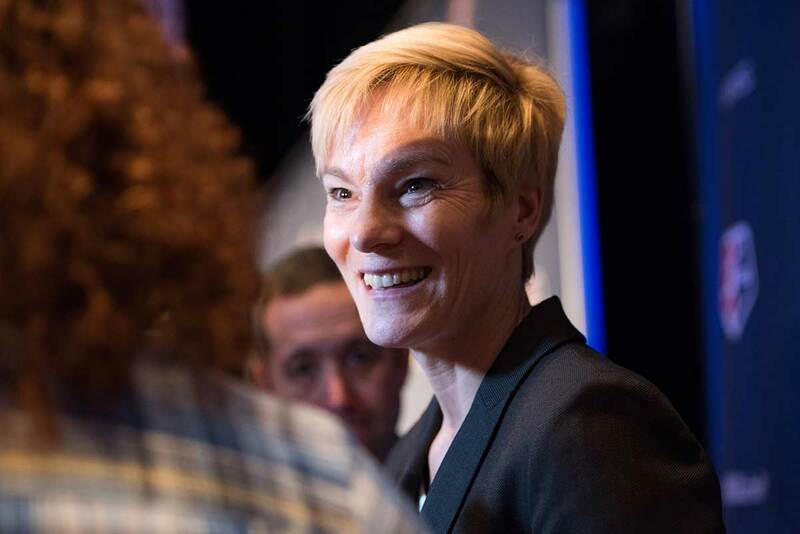 Amanda Duffy, acting commissioner of the NWSL, at the 2018 NWSL College Draft. Name a commish already. Trade! Media at the 2018 NWSL College Draft. The 2018 NWSL Collge Draft, under the lights. Zoey Goralski, No. 27 pick by Chicago. Houston Dash head coach Vera Pauw. "New" kid on the block, the Utah Royals FC. Orlando's head coach, Tom Sermanni. Schuyler DeBree, No. 11 pick by Washington. New ball, who dis? 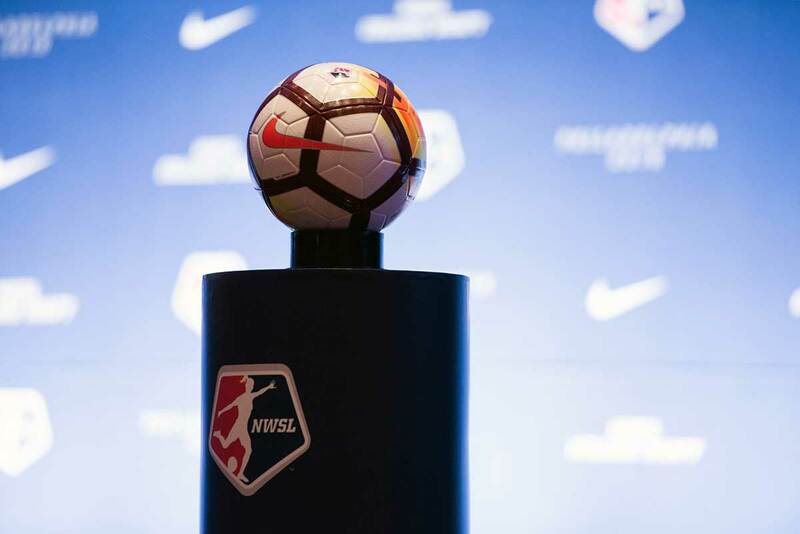 The 2018 National Women’s Soccer League (NWSL) held its sixth college draft on Thursday, January 18, at the United Soccer Coaches Convention in Philadelphia. As expected, Andi Sullivan was selected as the No. 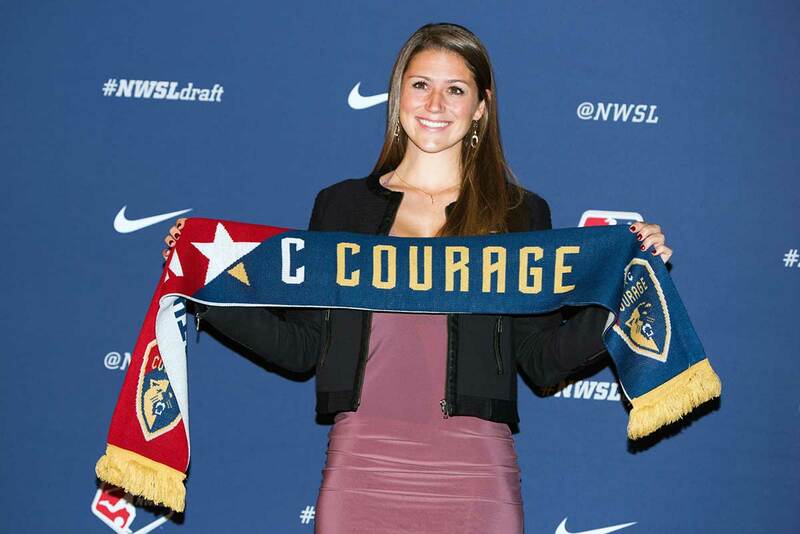 1 overall pick by the Washington Spirit. South Carolina’s Savannah McCaskill is headed to Boston as the No. 2 overall pick. 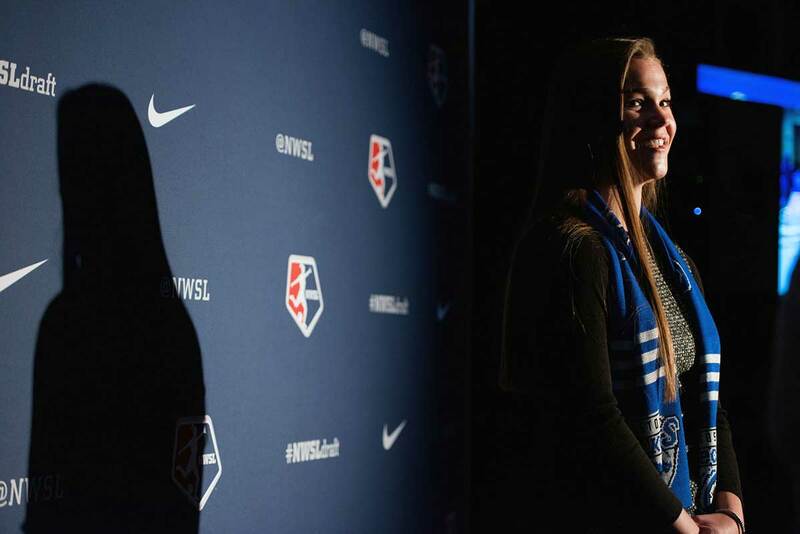 Rounding out the top three, Duke’s Rebecca Quinn will join Sullivan in Washington. The full list of selections is below. 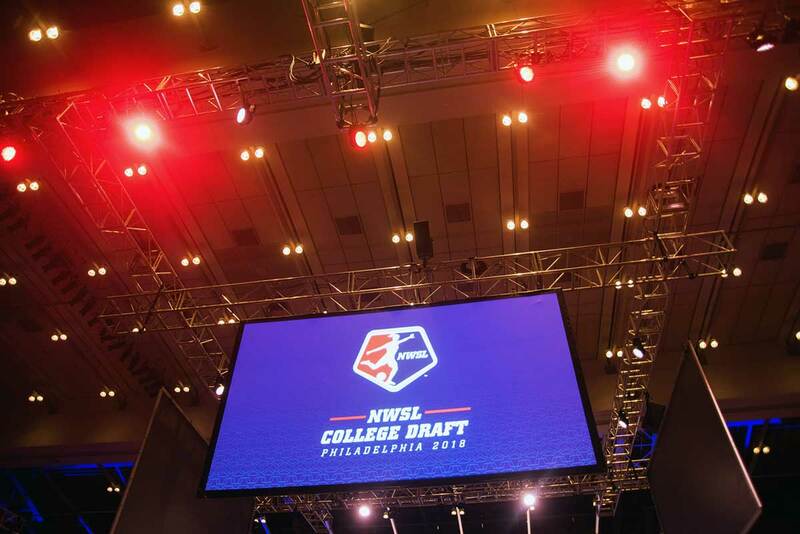 Duke showed up big, with six players chosen at this year’s draft, equaling the number of players drafted in a single draft set by UCLA at the 2015 NWSL College Draft. 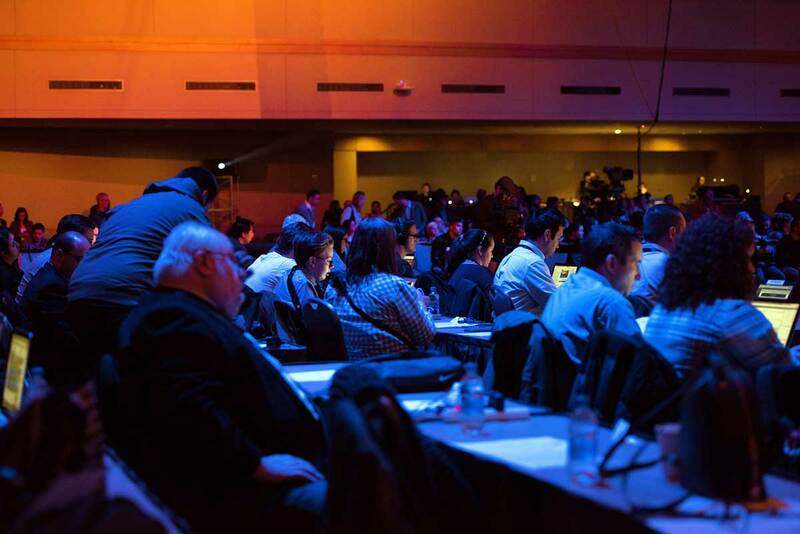 The draft consisted of four rounds with 10 selections per round. A blockbuster of a trade happened during the draft that resulted in some shuffling of the draft order. 1. 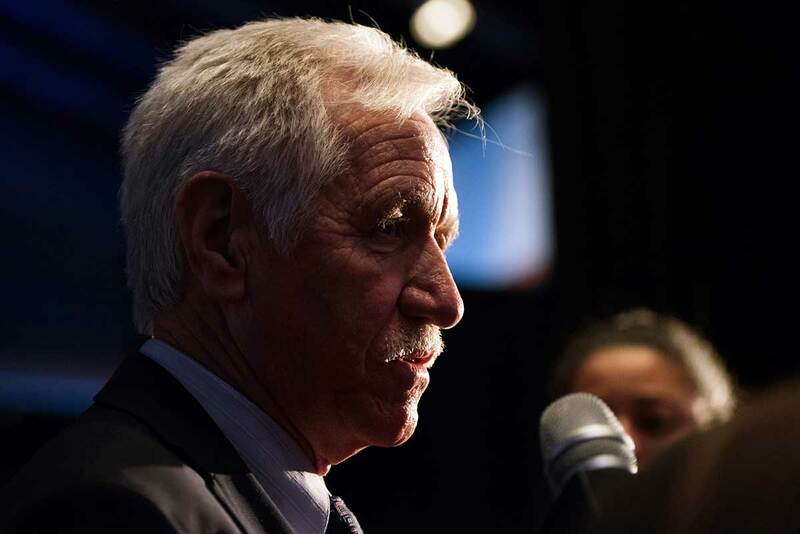 The Chicago Red Stars sent Christen Press, the No. 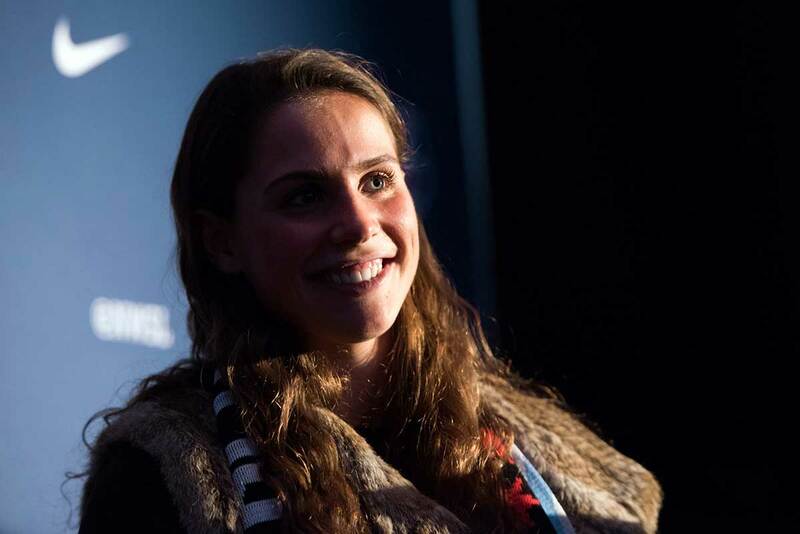 7 pick, and a 2018 international roster spot to the Houston Dash in exchange for Carli Lloyd, Janine Beckie, and the No. 6 and No. 24 picks. 2. Chicago traded Lloyd, Beckie, Jen Hoy, the No. 6 and No. 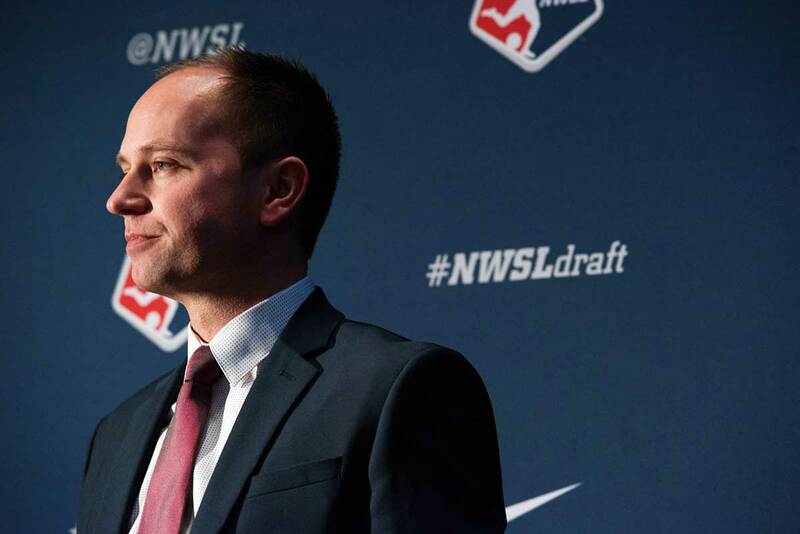 13 picks to Sky Blue FC in exchange for Sam Kerr, Nikki Stanton, and the No. 15 pick. All images by the terrific Monica Simoes. 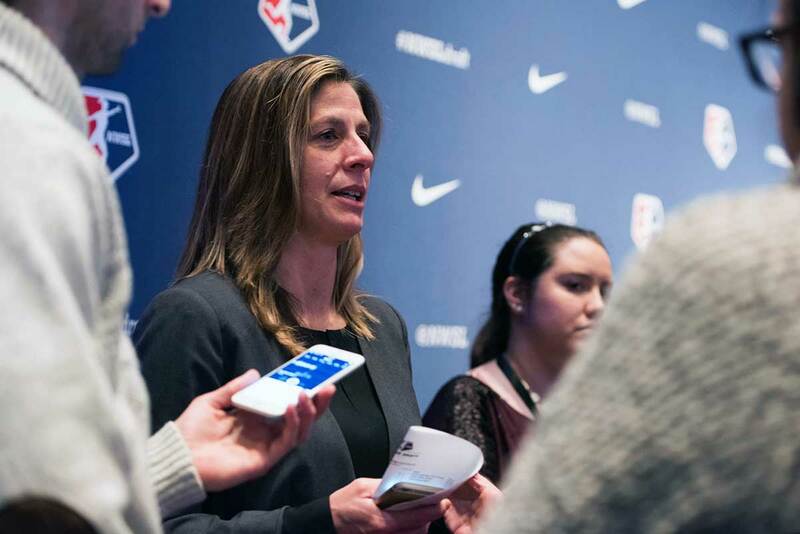 Sky Blue FC head coach Denise Reddy speaking with media at the 2018 NWSL College Draft. 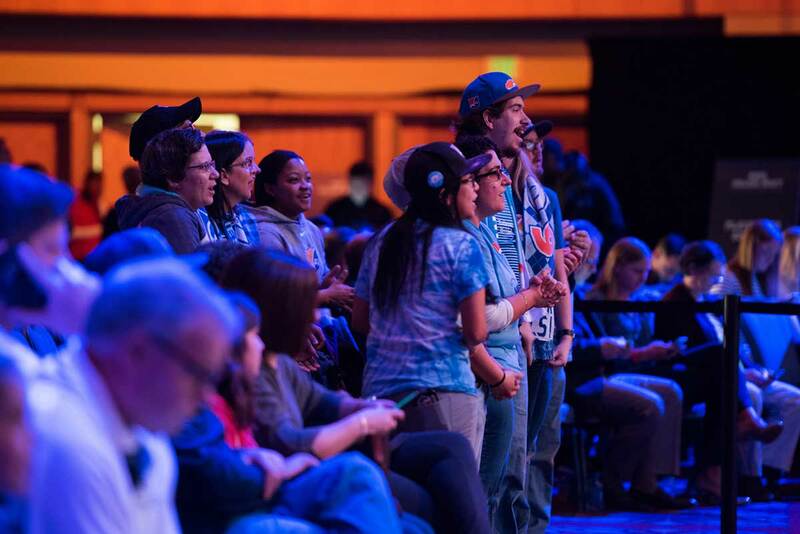 Cloud 9, Sky Blue support group, at the 2018 NWSL Collge Draft. 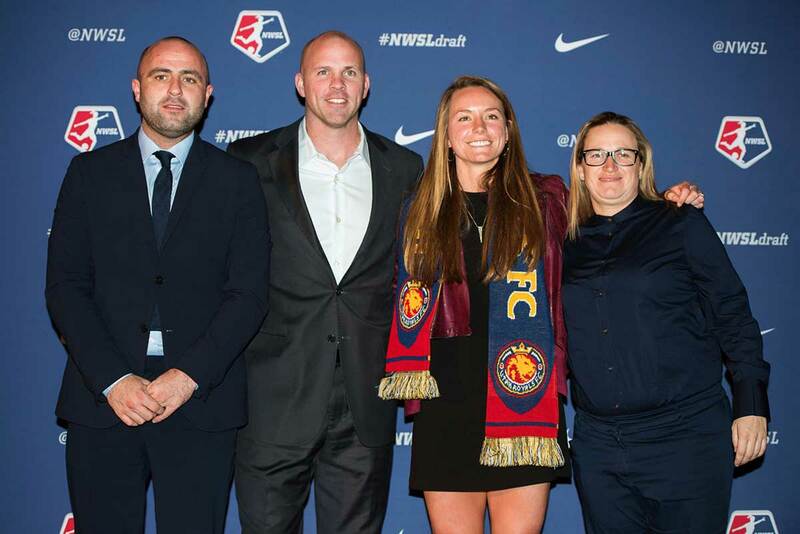 Nadine Angerer at the 2018 NWSL Collge Draft. 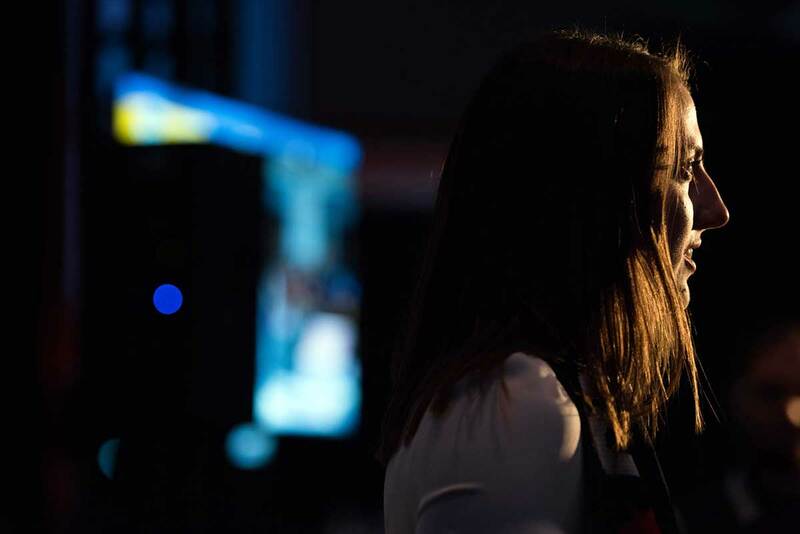 Nadia Gomes, draftee of Orlando Pride, at the 2018 NWSL College Draft. Morgan Reid, North Carolina’s pick at No. 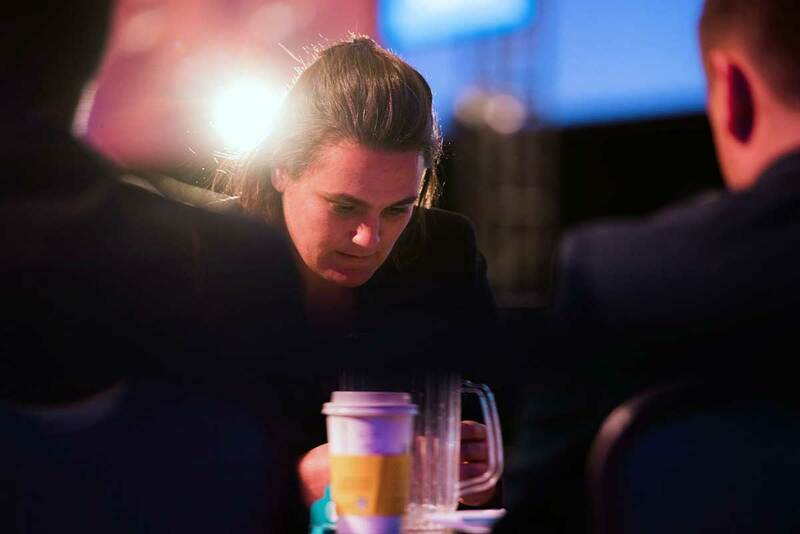 38, at the 2018 NWSL Collge Draft. Mark Parsons, head coach of the Portland Thorns. 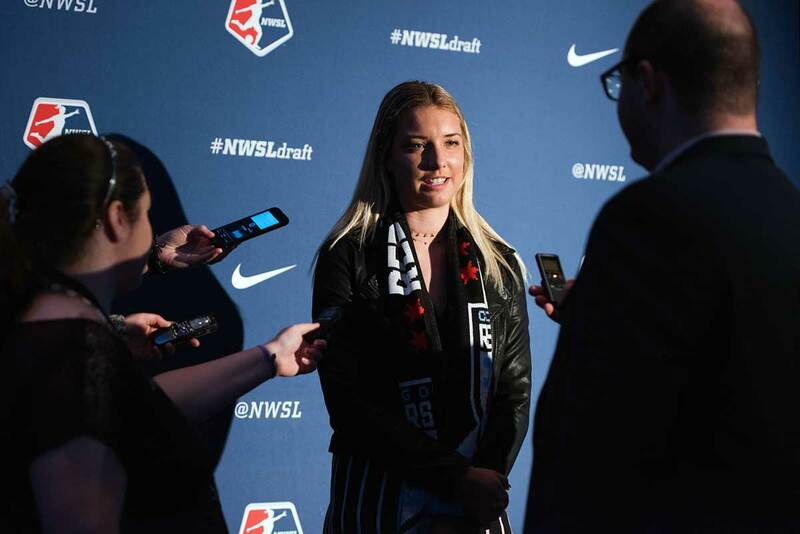 Mallory Eubanks addressing the media at the 2018 NWSL Collge Draft. 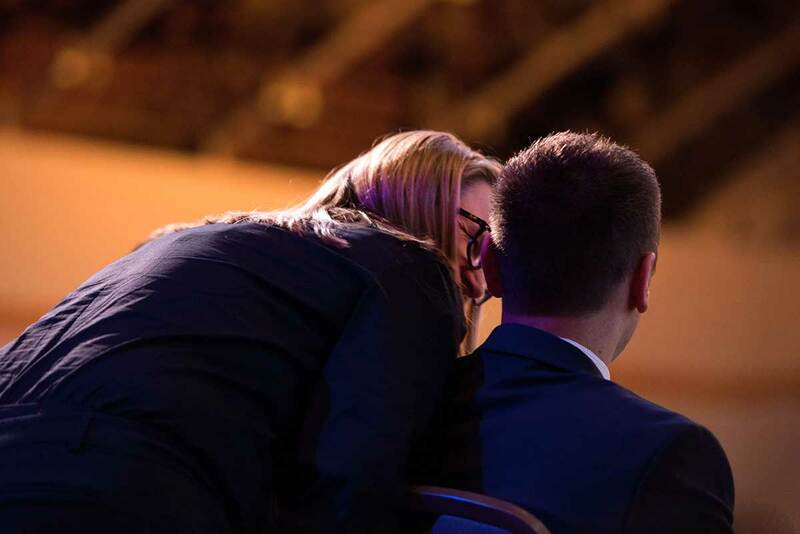 Laura Harvey and Vlatko Andonovski at the 2018 NWSL College Draft. Oh, what we would give to know what this is all about. Harvs and MarPar. Joanna Boyles, No. 32 pick by Boston. Indigo Gibson after being drafted by Chicago. Imani Dorsey, minutes after being drafted by Sky Blue. Emily Boyd, drafted at No. 15 by Chicago. EJ Proctor with Utah Royals head coach Laura Harvey and staff. There’s always one. Brianna Visalli, No. 19 pick by Chicago. 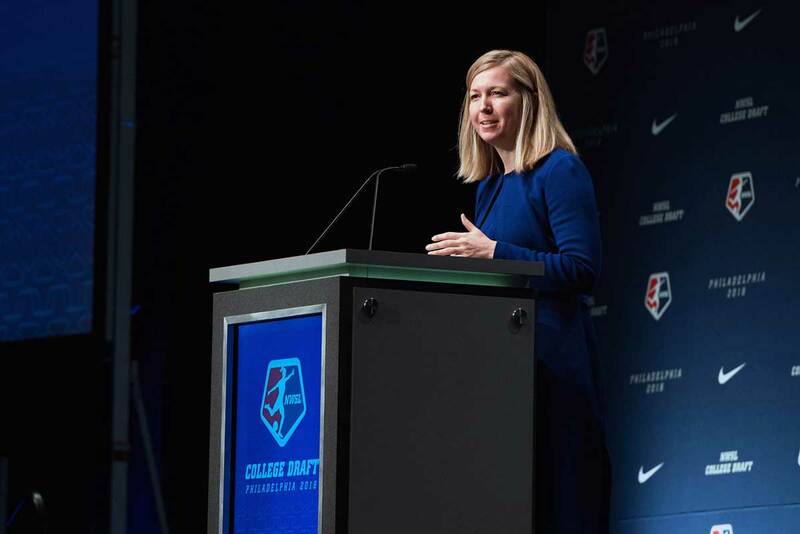 Amanda Duffy, acting commissioner of the NWSL, at the 2018 NWSL College Draft. Name a commish already. 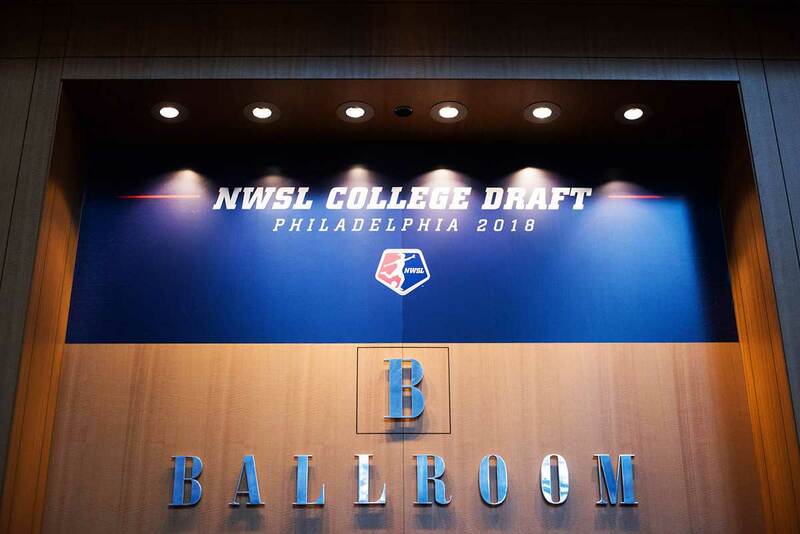 Entrance to the 2018 NWSL College Draft. 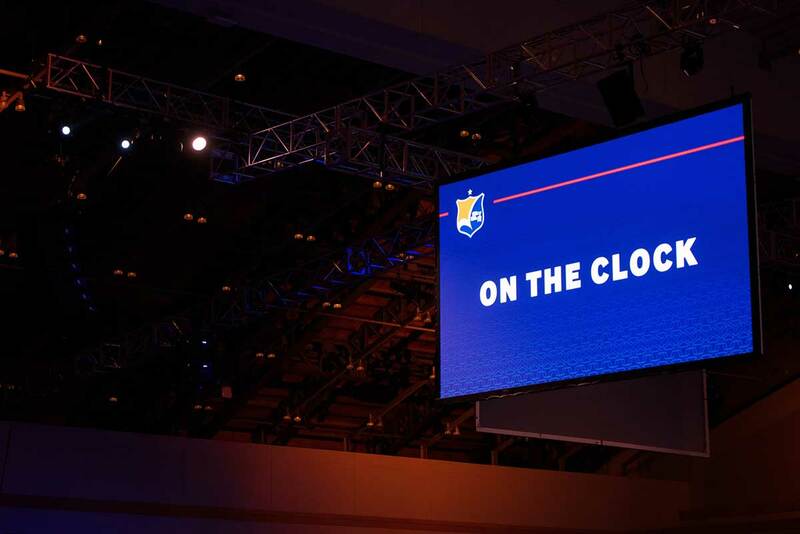 Scenes from the 2018 NWSL Collge Draft. Media at the 2018 NWSL College Draft. The 2018 NWSL Collge Draft, under the lights. Zoey Goralski, No. 27 pick by Chicago. Houston Dash head coach Vera Pauw. “New” kid on the block, the Utah Royals FC. Orlando’s head coach, Tom Sermanni. Schuyler DeBree, No. 11 pick by Washington.